3" X 10" Heavy Duty Blade, .094 thickness. Works on VCT, VAT, wood, tile rubber epoxy, elastomeric coatings, scraping thin-set, glued ceramic. 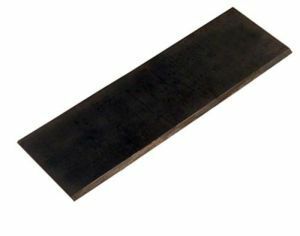 3" X 10" Heavy Duty Blade, .094 thickness. A heavy duty blade that still has a little flex. Made with National's proven blade hardening process, these blades will stay sharper longer with better overall performance than any other blade on the market. Works on VCT, VAT, wood, tile rubber epoxy, elastomeric coatings, scraping thin-set, glued ceramic.